Is a pellet stove right for me? 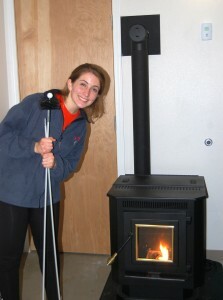 First firing of the pellet stove at the UAF Sustainable Village, which serves as a backup heater in the northwest house. Pellet stoves are a relatively new wood heating appliance, similar to wood stoves in concept but they have automated operation and burn processed biomass. Pellets are manufactured from compacted sawdust, wood chips, agricultural crop waste, waste paper and other materials. They can also be made from biomass fuels such as nutshells, corn kernels, sunflowers and soybeans. Pellets are about 1 inch long and look like rabbit food. The pressure and heat created during production binds them together without the need for glue. Pellets are manufactured in Alaska, including at Superior Pellet Fuels in North Pole, and are available at local hardware stores and by delivery from manufacturers. Stoves are designed to heat a space directly. The stove consists of a combustion chamber, ashtray and flue to vent exhaust gases. In a pellet stove, the flue can be direct-vented through a wall, meaning that no chimney is required. Pellets are stored in a hopper near the stove. The hoppers come in various sizes, but generally can hold enough pellets for the stove to run for more than a day. The motorized systems are controlled by a control system and allow pellet stoves to operate automatically. Pellet stoves do not have a distribution system. The fire inside the combustion chamber causes the stove to warm up and radiate heat throughout a room. Pellet boilers are available that use a hydronic distribution system. As with other wood-burning devices, pellet stoves require frequent maintenance, yet less than a wood stove. The stove should be inspected regularly. Also, the hopper must be filled and the ashtray should be emptied on a weekly basis (though this depends on the size of the hopper and ash tray and the frequency of use). Additionally, the stove should have a yearly check-up. Heating professionals can check that the doors, gaskets, electric connections and seals on the stove are in good condition. They can also check the chimney for creosote, rust, and corrosion. Pellet stove efficiency ratings are published by manufacturers. The efficiency ratings combine electrical efficiency, combustion efficiency (a measure of the heat produced from burning fuel), and heat transfer efficiency. Efficiencies can range from 78–80%. More efficient stoves lose less heat up the chimney and deliver more heat into the home. Posted in Ask A Builder and tagged alaska, Appliances, Biomass, CCHRC, cold climate housing research center, fairbanks, Heating, pellet stove, pellets, wood burning on March 14, 2013 by mrettig.